1) The string making was founded in 1613 by Antonio Romanin which was succeeded by Antonio Priuli. The company was therefore called ‘Antonio Pruli so-called Romanin ‘ and so remained until became property inherited by Callegari family. About Giovan Battista, Napoleone Pietrucci in the ‘Biography of Paduan artists’ printed in Padua in 1858 wrote that: “ In Padua there was a very well known string making factory that was always encouraged in most important capitals of Europe‘. Giovan Battista died in 1818 at the age of 77. It is very interesting to learn that the disposal of the strings produced by Priuli had taken a European dimension. 3) Notification of 10 October 1849. We learn that the company is followed by Antonio Callegari inhabitant in Via San Carlo, 3368 and engaged in the business for 43 years (ie since 1806) and that there are two workers. 4) Notice of exercise of 26 June 1869 to the office of the Chamber of Commerce of Padova: we learn that the persons owning the company are Callegari sisters Angela, Teresa and Domenica. The petitioner is unique and signature ‘of the late Antonio Angela’. The production was still in Padua, in Via San Carlo , 3368. The header in the spreadsheet (then deleted) reported ‘the late Antonio Callegari Girolamo’ as owner of the company. 5) Deed of 7 July 1877. Are present from one side Angela, Teresa, Domenica Callegari and Maria and Girolamo Callegari as counterpart: it is stated that Maria and Girolamo are brothers of the late Antonio. The act specifies that the document of 1869 ‘was for simple error’ added the name of Girolamo as owner of the company. 6) Deed of 12 August 1881: it declares that Girolamo, Angela and Teresa ‘brother and sisters of the late Antonio’ are the only representatives and owners of the company ‘Antonio Priuli so-called Romanin’ and Co. It is specified that the sisters are not married. It is not know anything more about the other sister, Domenica. 7) Deed of October 6, 1891. It is specified that Girolamo Callegari, died in 1883, was co-owner and it is notified that Teresa Callegari (due to advanced age) will leave the activity for the children of Girolamo, of which only Antonio is older. The other children, Emilia, Marianna, Angelina and Maria are still minors in custody of their mother, Anna Santamaria. Nothing is written about Teresa’s sister, Angela, maybe she died. 8) Deed of 22 October 1891: Teresa Callegari states to withdraw from her activity . 9) Activity Notification of October 31, 1891: it is declared that Antonio of late Girolamo and Marianna, Emilia Angelina and Maria are holders of the company. The company is always in Via San Carlo 3368. 10) Deed dated 30 January 1902: Antonio sells his activity to Giuseppe Drezza coming from Verona and the right of gut supplies foreseen for company Romanin and undertakes to stop his activity of string maker and also not to teach or give advice on string making art. 11) Deed dated 13 March 1902: Antonio’s sisters, Emilia, Angelina, and Maria, co-owners of the company and the elder sister Teresa, sister of the late Girolamo ask that company Romanin is delated from Company Registration. 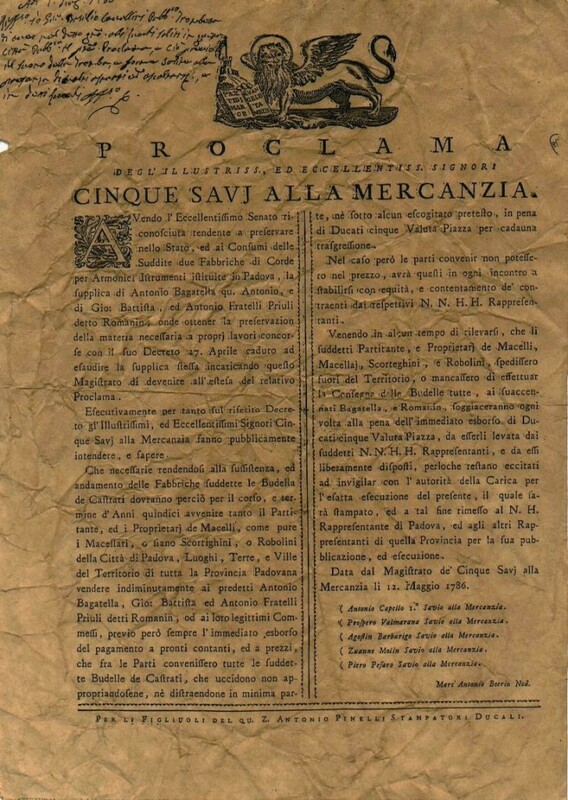 12) Notice of Business in its own name, June 5, 1911: Antonio Callegari late Girolamo resident in Via Zabarella, on January 30, 1902 opened an activity of sale of musical instruments in Via Cassa di Risparmio: the glorious tradition of stringmaking in Padua turns at the end. In Padova until a few years ago , there was a cafè called ‘Alla Corderia’ and was located in Via Zabarella near the intersection with Via San Francesco. In phone directory (2002) are present, only in the city of Padua, 5 people with the surname ‘Callegari’.